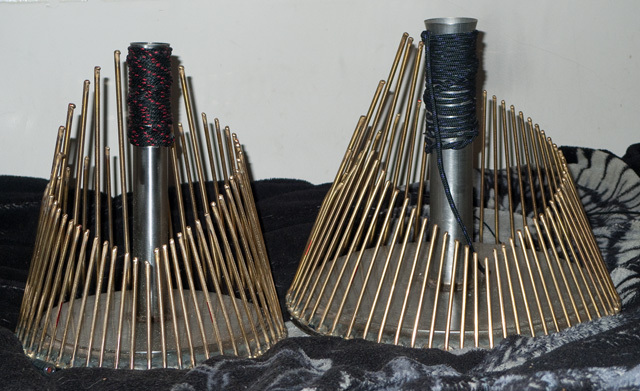 I have a new Waterphone, a “Whaler” – much smaller than my original “Megabass”, and a lot easier for me to play live. It arrived for my birthday, but I was out of the country. A neighbor took care of it, and handed it over to me on Tuesday – just in time for our almost regular Wednesday jam. We played for about an hour. Here are the last 11 minutes and a quarter – a bit of slightly oriental sounding abstract ambiance, very quiet, mainly Bass and Guitar: Reprise (12.5 MB, in the iTunes/iPod MPEG4/AAC format, opens in a new window). Most of the time my Waterphone is just barely there in the mix, but I like it a lot. I don’t always need to be loud and obvious, eh? Actually, I am using a new extended technique about three quarters into the piece which is loud and obvious – but it doesn’t sound like a Waterphone: I placed a metal protector for a saxophone reed on the top of one of the rods. Striking the rod produces a very subtle complex rattle. This entry was posted in Articles With Music For Downloading, Playing The Waterphone. Bookmark the permalink. that’s the plan, Richard, thanks! I hope you are all right – I keep hearing about really bad storms in your part of the World.